What Is the Difference Between Olive Oil & Sunflower Oil? The most obvious difference between olive and sunflower oil is the source. Olive oil is derived from pressing olives, while sunflower oil comes from sunflower seeds. While each type of oil is plant-based and their calories are similar -- about 120 calories per tablespoon -- they do have several nutritional differences. Both olive and sunflower oil are rich in monounsaturated and polyunsaturated fats. These beneficial fats bring down your low-density lipoprotein, or LDL cholesterol, while elevating the good high-density lipoprotein, known as HDL. This process protects your heart, lowering your risk of heart disease and stroke. 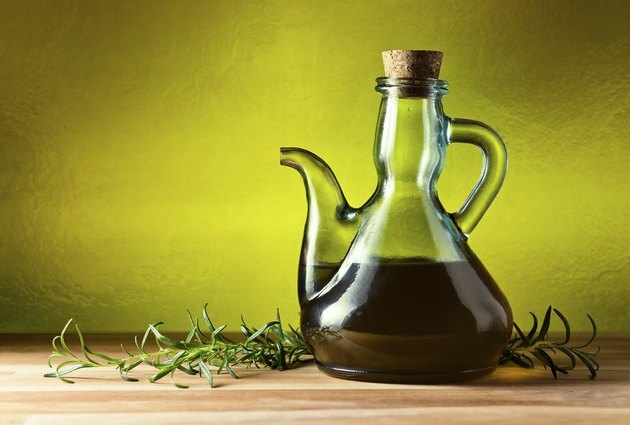 Linoleic types of sunflower oil are particularly higher in polyunsaturated fats -- 65 percent of the fat in this sunflower oil is polyunsaturated, compared with just 10 percent in olive oil. Polyunsaturated fat goes above and beyond protecting your heart. It contains omega-3 and omega-6 fatty acids. These components reduce inflammation, support neurological communications and are essential for everyday growth and development. Get plenty of antioxidants, such as vitamin E, in your diet to effectively ward off damaging free radicals. Vitamin E shields all cells, which can reduce your risk of developing chronic diseases and certain cancers. All adults need 15 milligrams of vitamin E every day, according to the Food and Nutrition Board of the Institute of Medicine. Sunflower oil gives you over a third of that recommendation, or about 5.6 milligrams from a tablespoon. You'll still get vitamin E from olive oil, although 1 tablespoon offers less than 2 milligrams. Vitamin K is responsible for activating mechanisms that start blood coagulation. It stops bleeding by clotting blood and forming scabs. If you're male, you need 120 micrograms of vitamin K daily, or if you're female, aim for 90 micrograms. You'll get more than 8 micrograms of vitamin K from 1 tablespoon of olive oil, while the same amount of sunflower oil provides less than 1 microgram. Plant oils in general have very few minerals. Sunflower oil doesn't offer minerals at all. You'll get several minerals from olive oil, albeit just trace amounts. The most prominent mineral in olive oil is iron, which you need to keep oxygen moving around your body for cells to function. Olive oil contains a little potassium and sodium, electrolyte minerals you need to keep your muscles and heart working. The only other mineral in olive oil is calcium, which your body uses for teeth and bone structure. Because olive oil is not a rich source of any of these minerals, you shouldn't rely on it to meet your recommendations. Is Palm Oil One of the Healthy Oils to Consume?